When something’s not right on your street, and you’ve gone out of your way to report it to the local council, the last thing you want is to get bogged down in a complex log-in procedure. That’s why FixMyStreet has always put the log-in step after the reporting step, and has always allowed you to report a problem without needing an account or password at all. But we know we can always do better, and in the 11 years that FixMyStreet has been around, new design patterns have emerged across the web, shifting user expectations around how we prove our identities and manage our data on websites and online services. Over the years, we’d made small changes, informed by user feedback and A/B testing. But earlier this year, we decided to take a more holistic look at the entire log-in/sign-up process on FixMyStreet, and see whether some more fundamental changes could not only reduce the friction our users were experiencing, but help FixMyStreet actively exceed the average 2018 web user’s expectations and experiences around logging in and signing up to websites. 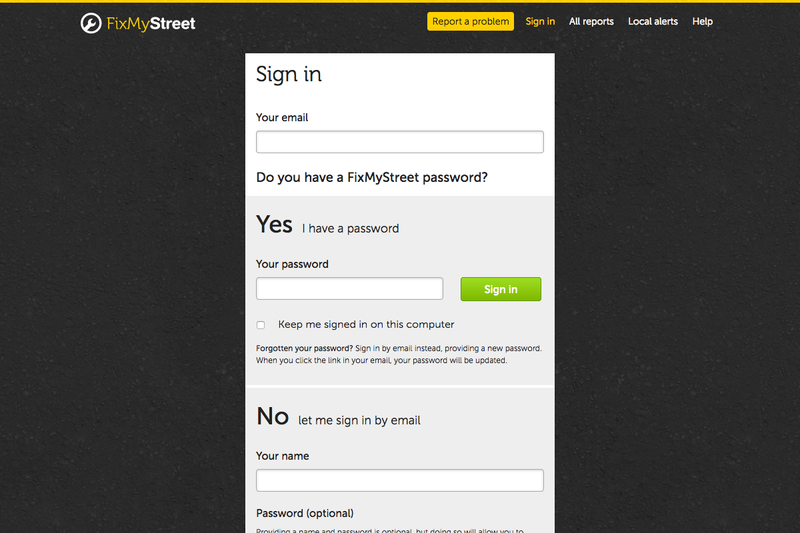 Previously, FixMyStreet tried to do clever things with multi-purpose forms that could either log you in or create an account or change your password. This was a smart way to reduce the number of pages a user had to load. 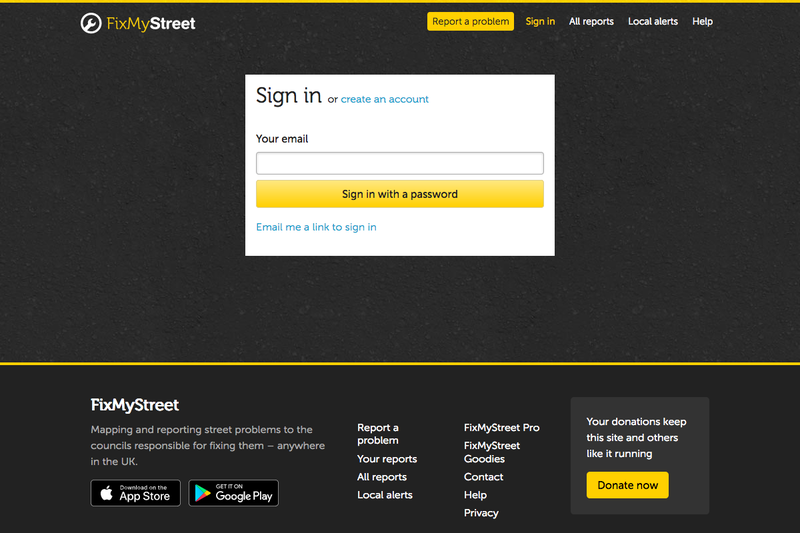 But now, with the vast majority of our UK users accessing FixMyStreet over high speed internet connections, our unusual combined log-in/sign-up forms simply served to break established web conventions and make parts of FixMyStreet feel strange and unfamiliar. In 2014 we added dedicated links to a “My account” page, and the “Change your password” form, but it still didn’t prevent a steady trickle of support emails from users understandably confused over whether they needed an account, whether they were already logged in, and how they could sign up. So this year, we took some of the advice we usually give to our partners and clients: do one thing per screen, and do it well. In early November, we launched dramatically simplified login and signup pages across the entire FixMyStreet network – including all of the sites we run for councils and public authorities who use FixMyStreet Pro. Along the way, we took careful steps—as we always do—to ensure that assistive devices are treated as first class citizens. That means everything from maintaining a sensible tab order for keyboard users, and following best practices for accessible, semantic markup for visually impaired users, to also making sure our login forms work with all the top password managers. 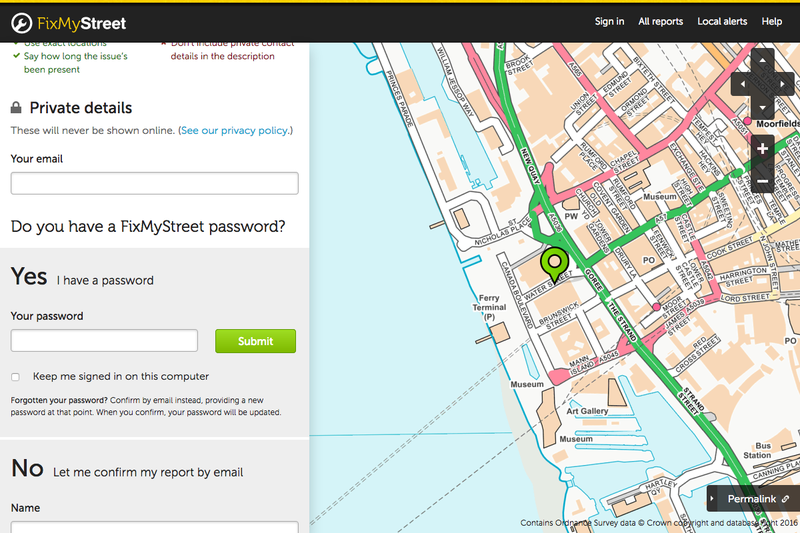 The simplified log-in page was a great step forward, but we knew the majority of FixMyStreet users never used it. Instead, they would sign up or log in during the process of reporting their problem. So, we needed to take some of the simplicity of our new log-in pages, and apply it to the reporting form itself. 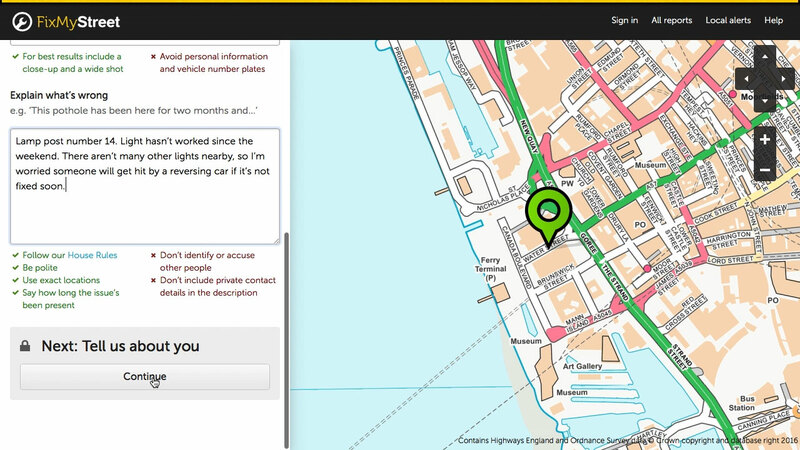 For a few years now, the FixMyStreet reporting form has been split into two sections – “Public details” about the problem (which are published online for all to see) followed by “Private details” about you, the reporter (which aren’t published, but are sent to the authority along with your report, so they can respond to you). This year, we decided to make the split much clearer, by dividing the form across two screens. Now the private details section has space to shine. Reorganised, with the email and password inputs next to each other (another convention that’s become solidified over the last five or ten years), and the “privacy level” of the inputs increasing as you proceed further down the page, the form makes much more sense. But to make sure you don’t feel like your report has been thrown away when it disappears off-screen, we use subtle animation, and a small “summary” of the report title and description near the top of the log-in form, to reassure you of your progress through the reporting process. The summary also acts as a logical place to return to your report’s public details, in case you want to add or amend them before you send. As I’ve mentioned, because FixMyStreet is an open source project, these improvements will soon be available for other FixMyStreet sites all over the UK and indeed the world. We’ve already updated FixMyStreet.com and our council partners’ sites to benefit from them, and we’ll soon be officially releasing the changes as part of FixMyStreet version 2.5, before the end of the year. I want to take a moment to thank everyone at mySociety who’s contributed to these improvements – including Martin, Louise C, Louise H, Matthew, Dave, and Struan – as well as the helpful feedback we’ve had from our council partners, and our users. We’re not finished yet though! We’re always working on improving FixMyStreet, and we’ll be keeping a keen eye on user feedback after these changes, so we can inform future improvements to FixMyStreet.com and the FixMyStreet Platform. 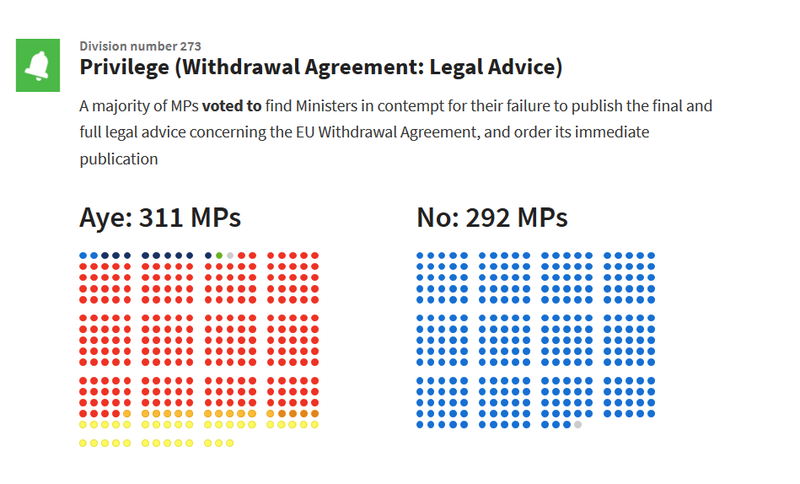 WhatDoTheyKnow Pro is our Freedom of Information service for journalists, and campaigners, and we’ve recently rolled out some major changes to the request sidebar to make reading, navigating, and classifying Pro requests a lot easier. Since the very first Alpha version of WhatDoTheyKnow Pro we’ve been receiving feedback from our users, which we have been feeding directly into our future development plans. The sidebar changes are the first round of changes that have come as result of direct Pro user feedback, and there will be more to follow. In WhatDoTheyKnow a member of the public can send a Freedom of Information request to an authority, which they receive in the form of an email. The request, as well as any replies or follow up from the requester, or the authority, are published on WhatDoTheyKnow. If the request is made by a Pro user, they have the added option of making a request private for a limited time. A longstanding or complicated request will often consist of many, many messages. So scrolling to the bottom of the page to read the most recent response, then back to the top to update its status involves a lot of interaction that we can remove. We can’t say for sure that a user will always be at the bottom of the request thread when updating the status of a request, but we can safely assume they are sometimes. Improve the experience of navigating requests with a long history. It’s a short, three step process, but a busy user catching up with a backlog may do this hundreds of times a day, so if we can optimise this workflow we can save a lot of time and frustration. For desktop users we’ve made the sidebar controls (where the ‘update status’ button is) “sticky”, so it will follow you as you scroll up and down the page, meaning you can update the request status from any position on the page. This really helps as requests get longer, as you no longer need to scroll back to the top to classify the latest response. We’ve added new message navigation buttons. This is to enable you to move through a request thread message-by-message by clicking the up and down arrow buttons, or using the arrow keys on your keyboard. We’ve also added a counter so that it’s easier to see where you are in the list, and to go back and forth to specific messages. 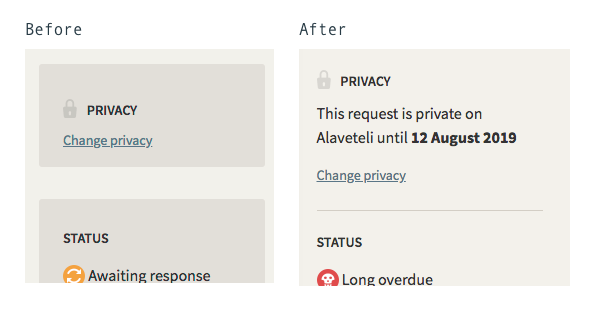 We’ve also taken this opportunity to make some key information about the privacy of your request visible at all times (this was previously hidden behind a click), and to tweak the design of the sidebar – making it easier to read and removing some visual noise. We’re looking at a way to add similar functionality to mobiles and other small screen devices. As screen space is limited it will require a separate design process. We’re aware that the problems we’re trying to solve aren’t unique to our Pro customers, so if the features work, and are well received, we’ll be making a similar feature available to all WhatDoTheyKnow users in the future. Keeping in mind that as our public users have different needs to our Pro users there are some design challenges to overcome beforehand. 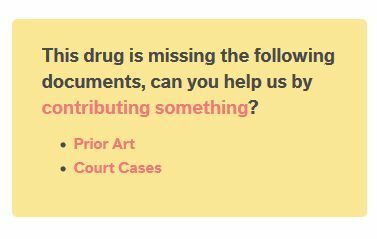 For example – the public request page has more features to help less-frequent users, because we’re keen to ensure that everyone can participate in the FOI process, not just experts. Conversely, Pro users are by their very nature more likely to require less guidance. We’re going to need to do more research on this shortly. Whether you’re a WhatDoTheyKnow Pro customer or not, we’d love feedback on this feature — or any other. Drop us an email to pro_team@whatdotheyknow.com. 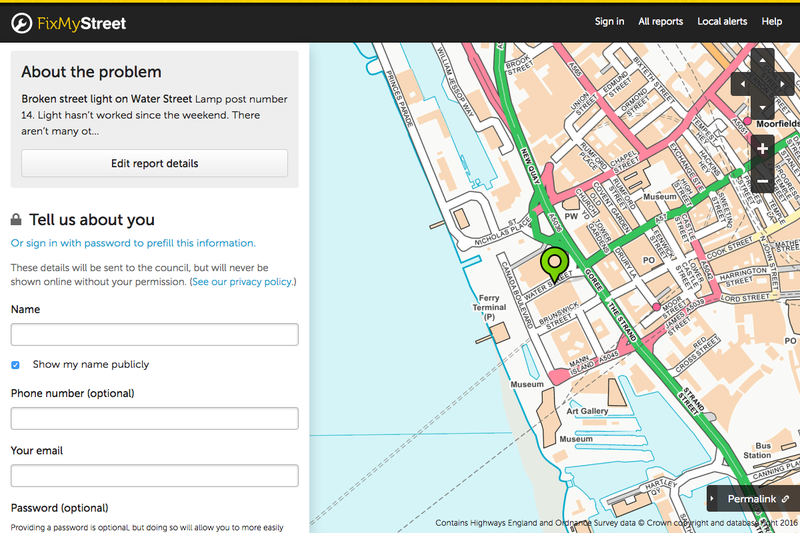 You might already be enjoying one of the usability improvements that FixMyStreet version 2.0 has brought, though it’s possible that you haven’t given it much thought. In these days of eBay and department store shopping, we’re all quite used to refining results through the use of multiple checkboxes. But for FixMyStreet, we hadn’t given much thought to letting you filter reports by more than one dimension, until Oxfordshire County Council suggested that it would be a useful feature. For quite some time, you’d been able to filter by category and status (“Show me all pothole reports” or “Show me all ‘unfixed’ reports”), but this new functionality is more flexible. 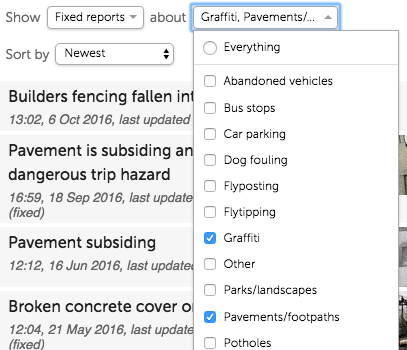 You can now select multiple categories and multiple statuses simultaneously (“show me all pothole and graffiti reports that are unfixed or in progress”) — and all through the power of tickboxes. If you’re a non-technical person, that’s all you need to know: just enjoy the additional flexibility next time you visit FixMyStreet. But if you are a coder, you might like to read more about how we achieved this feature: for you, Matthew has written about it over on the FixMyStreet Platform blog. This year we embarked on a ground-up redesign of Alaveteli’s theming capabilities to make customising Alaveteli easier and faster. We used a mixture of techniques to try to achieve this and since releasing the update we’re happy to have seen a decrease in the complexity of our themes, and the time we spend making them. Alaveteli, our Freedom of Information platform is one of our most deployed software packages and each deployment requires some customisation, from simple branding changes to complex functionality to support a country’s FOI process. This is either done internally by our own developers, or our partners take this on themselves. An Alaveteli deployment consists of two things, the core: the guts of Alaveteli with no customisations, and the theme: the aesthetic and functional customisations made to each site. We ship Alaveteli with a fully-featured base theme that gives partners a good starting point to work from, but they can also start their own theme from scratch. After talking to our partners and the Alaveteli team we felt that the process of theming was too complicated and involved. It required a lot of knowledge of Alaveteli’s inner workings, was coded in a way that made it hard to understand, and almost always required the intervention of a front-end expert, even to make trivial changes. Intuitive Front-end developers and designers should be able to follow and understand the templates without needing expert knowledge about Alaveteli’s inner-workings. Flexible Overriding Alaveteli’s core code should be easy, so a theme should use low-specificity, componentised code to enable this. Supportive Should a partner decide to only change a few colours, or embark on a large-scale redesign Alaveteli, the theming process should never get in the way. Alaveteli is built on Ruby on Rails, so our first goal was to make better use of Ruby on Rail’s template inheritance. Firstly, we split all of the Sass files into logical components. 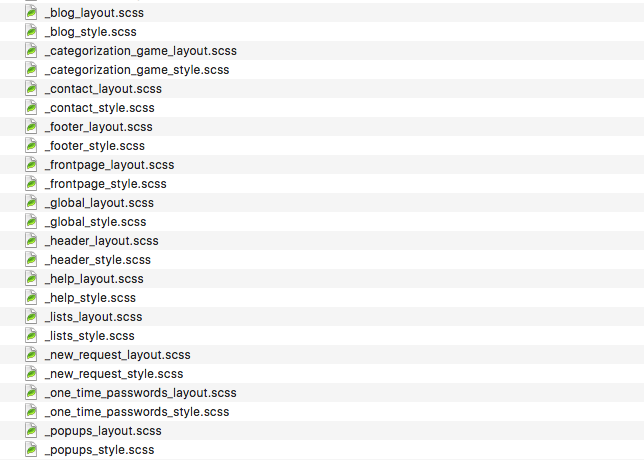 Each component has two associated Sass files, a layout.scss and a style.scss. layout.scss describes only layout of a component, e.g. the physical dimensions and position on a page. style.scss describes the styles, for example typefaces, colours, borders and other presentational properties. Should a partner wish to totally redesign or replace a component, they can replace both files with their own. Alternatively they can just choose to replace one part of the component, for example keeping the layout, but replacing the styles. When customising Alaveteli we want to be sure that a partner never has to fight with the base theme to achieve their goals. 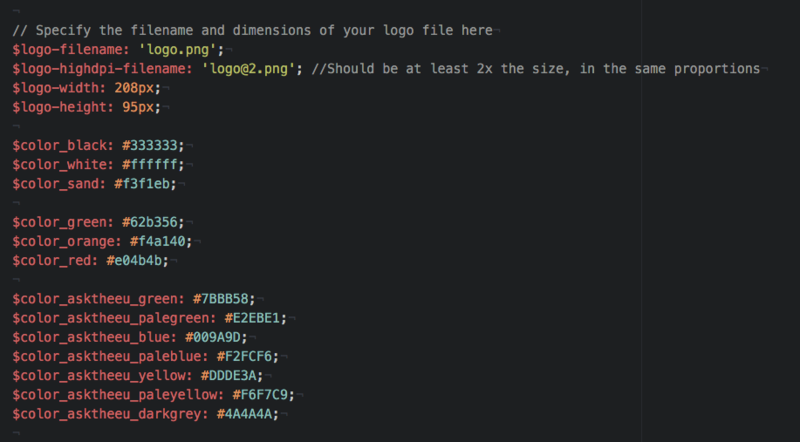 The most important part of this is to ensure CSS styles are easy to override. Firstly we removed all ID selector’s from Alaveteli’s stylesheets and replaced them with class selectors, giving us a good jumping off point as class selectors have much lower specificity than IDs. We then rewrote and refactored Alaveteli’s CSS using the Block Element Modifier methodology (BEM). BEM helped us in two ways: it’s written in a way that makes CSS self-describing, for example the code snippet .header__navigation__list tells us that this list is a child of the navigation element and a grandchild of the header element. As well as this, using a single class to define the styles for this element means that using BEM gives our styles the lowest possible specificity, so partners can override them with little resistance. All of our theme’s styles use the variables defined in _settings.scss when referencing colours, typefaces, spacing, and even logo files so the bulk of Alaveteli’s customisation can be done in our base theme’s settings partial _settings.scss. This allows partners to make simple changes which have a huge impact on the look and feel of the site. We’ve found that the large majority of our theme customisation can be done by just changing the variables in this file and it has sped up the theming process markedly. We’ve quietly rolled out these updates to Alaveteli over the past 12 months and the impact of the changes has been encouraging. Internally, we’ve found our theming projects are faster and more efficient. We conservatively estimate that it takes half the time to make a new theme than it used to. Thanks to the self-documenting nature of BEM and the styles encapsulated in our settings partial, Alaveteli theming requires a lot less understanding of the platform’s inner workings. Our partners are able to be more self-sufficient and rarely require our intervention to assist with simple customisations. Maintenance and support of our themes is greatly simplified, as the structure is consistent across projects, we’re able to roll out further changes and fixes in a more predictable way. Overall, we’re really happy with how the changes worked out and the things we’ve learnt from this project we’ll be carrying into our others too, so look out for changes like across our work in the future. When someone uses mySociety software to report a street problem, or make a Freedom of Information request, it’s often in a language other than English, because our code is used to power sites all over the world. That’s fine: we include a facility for people to add translations to the sites they deploy, so, job done, right? Except, unfortunately, there’s more to it than that. However much we complain about the idiosyncrasies of our language, there’s one thing English has got going for it, and that’s conciseness. And that means that words and phrases which fit quite nicely into our designs suddenly become problematic. 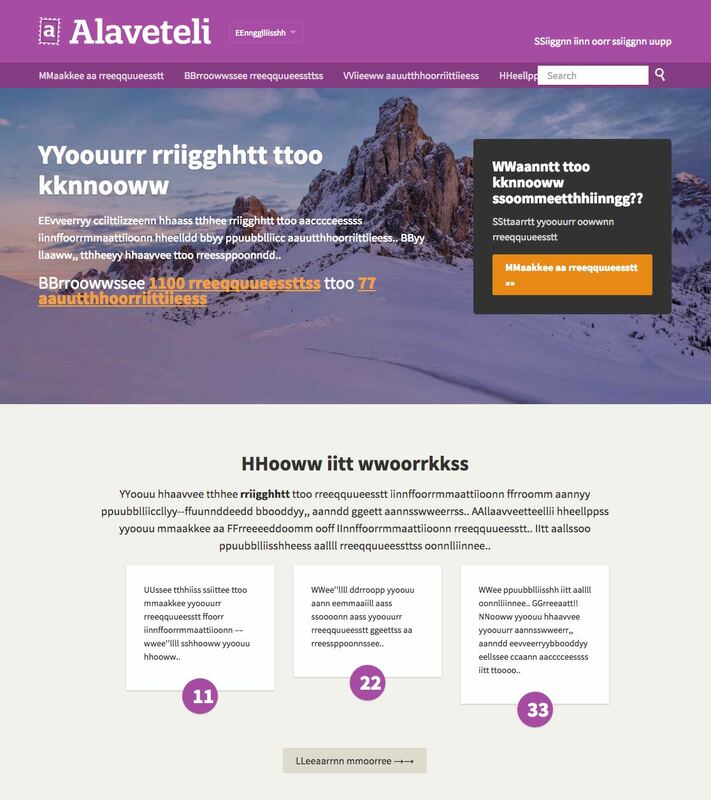 A recent front-end design ticket in Alaveteli, our Freedom of Information platform, centred around improving the display of various standard elements (the navigation bar, language switcher, logged-in user links) when the Alaveteli site in question is displaying in a language other than English. It was enough to make a designer sob. To put it bluntly: As soon as those carefully-crafted navigation bar links get translated, all bets are off as to whether they’ll continue to fit in the space provided. It’s an issue that’s faced by anyone creating software designed for international reuse. So I figured I’d share a few things the mySociety design team has learned about internationalisation, and one quick trick that I recently started using to test international language lengths on our own websites. Not only are some languages more verbose than others (ie: they use more words to convey the same concept), but many use more characters per word. Then there are other languages which use fewer—but more complex—characters that need to be displayed larger to still remain legible. That’s a 150–200% increase in space required to display words in the European / South American languages that we deal with quite a lot here at mySociety. So—no need to worry—it’s just short little bits of text that hurt the most. Phew. Hang on, short little bits of text… like all those buttons and links all over every single website mySociety makes? There are lots of tricks we can use to reinforce our layouts to better handle long strings. For instance, where possible, we avoid creating horizontally-constrained navigation bars. And in some cases, we can use modern styling techniques like Flexbox to better handle overflowing text without harming legibility or the overall layout of the page. But testing the effectiveness of these techniques can take time and, while we have a fantastic network of volunteers and international partners who translate our open source projects, we’re often working on the initial layout and styling before that has a chance to happen. While I was working out fixes for the Alaveteli user links and language picker dropdown, I threw together a quick “pseudolocalize” function that temporarily makes the text longer, so we could preview how it’ll look once it gets translated. Only later did I discover that “Pseudolocalization” is, apparently, a real thing, originating from the Windows developer community. Typically existing Pseudolocalization functions would do all sorts of orthographic substitutions to test how weird characters are displayed, as well as padding the strings to make them longer. So, something like Account Settings would be transformed into [!!! Àççôûñţ Šéţţîñĝš !!!]. My little function skips the weird character substitutions, and instead just doubles the text content of any elements you tell it to. Yep, it’s useful and it’s ridiculous — our favourite combination. Plus, it’s super fast, and it works with nested elements, so if you were totally crazy, you could just run it on the entire 'body' and be done with it! Now, we’re not saying we’ll be able to cope with, say, the longest word in Sanskrit, which is 431 letters long, but this approach does make us pretty confident that we’ve got a great basis for whatever most languages can throw at us. If you’re a web developer with similarly ingenious tricks for improving the internationalization of your sites, share them in the comments box! You’ve probably seen the recent news story about the guy who bought, then vastly increased the price of a vital drug: it’s been widely shared on social media in the last couple of days. 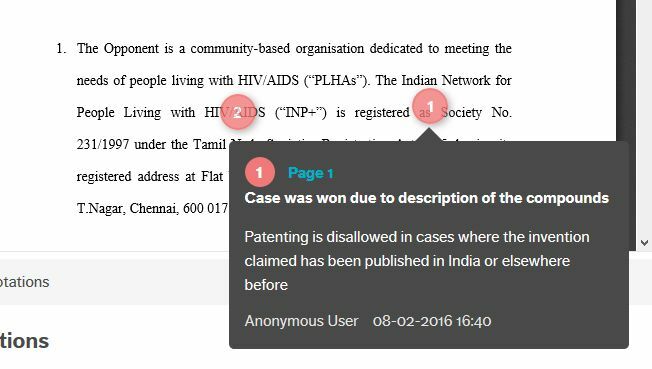 Not long ago, we blogged about the work we’d done on the Patent Oppositions Database. You may have found the concepts involved somewhat abstract. If so, now’s a great time to go and read it again, with this news story in mind. It’s an excellent example of what that project is hoping to prevent.